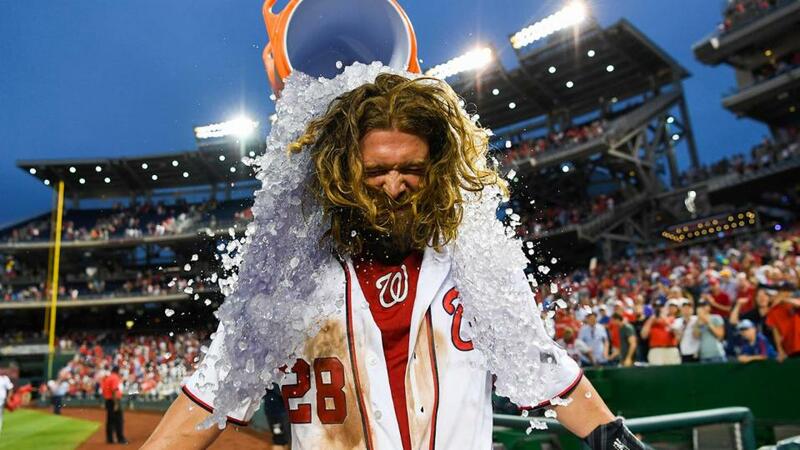 Washington Nationals' hirsute veteran Jayson Werth hit a walk-off single in the 12th inning on Wednesday night to give the Nats a 5-4 win over the Cubs in the series' rubber match. It was a big win for the Nationals - a possible N.L. playoff preview - and in an interview with MESN's Dan Kolko afterwards, Werth was very fired up. "Holy sh*t!" he screamed into the microphone, which echoed around the entire stadium. "Hey, Kolko, we should do this more often." Kolko laughed nervously, in the way broadcasters do when their interviewee curses on live TV, and asked Werth to keep the curses down. Werth did not. Instead, he proceeded to scream into the microphone to tell the haters - you know, those who have lambasted the 37-year-old for being old, and for not hitting well - to kiss his you-know-what. The Nationals fans loved it.